The question of how to account for uncertainties in regional climate projections is tackled within the Helmholtz Climate Initiative REKLIM (Regional Climate Change). Suitable ensemble generation techniques will be developed and applied in order to assess changes of the mean climate state as well as of the likelihood and variability of extreme events in the present and future climate. IMK-TRO contributes to the topics 1 (regional climate modelling, ensemble generation) and 6 (extreme events). In the following, the subprojects are described more detailed. Which effect hast the Atmospheric Forcing Shifting (AFS) on RCM simulations? How do synoptic conditions and orography control the effect of the AFS? Is the generation of RCM ensembles using AFS a benefit, in particular for extreme event studies? The simulations are conducted using the RCM COSMO-CLM with a horizontal resolution of 50 km for Europe (Fig. 1). ERA-40 reanalysis provide the initial and boundary conditions which are updated every six hours. Ensemble generation via AFS is realised by shifting the atmospheric forcing from the ERA-40 reanalysis with respect to topography, land cover and soil to the North (N), South (S), West (W) and East (E) by 25 km (1) and 50 km (2), respectively (Fig. 2). The shifted atmospheric fields are then used to drive the 50 km COSMO-CLM runs and, thus, eight shifting scenarios (N1, N2, S1 etc.) are performed, plus the reference simulation (Ref) which is forced by the non-shifted atmospheric fields. In addition, the output from the 50 km simulations drives the COSMO-CLM simulations at 7 km resolution for Germany. Fig. 1: Simulation domain for the COSMO-CLM simulations at 50 km resolution. The blue rectangle marks the investigation area. Fig. 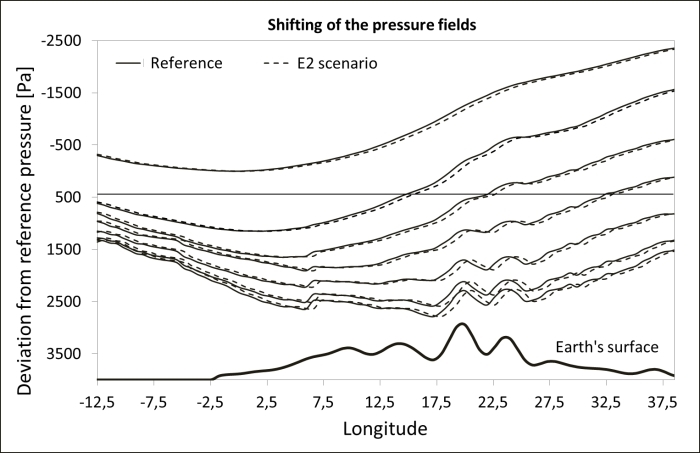 2: Shifting of the pressure fields from the reference state (Ref) to the East by 50 km (E2). 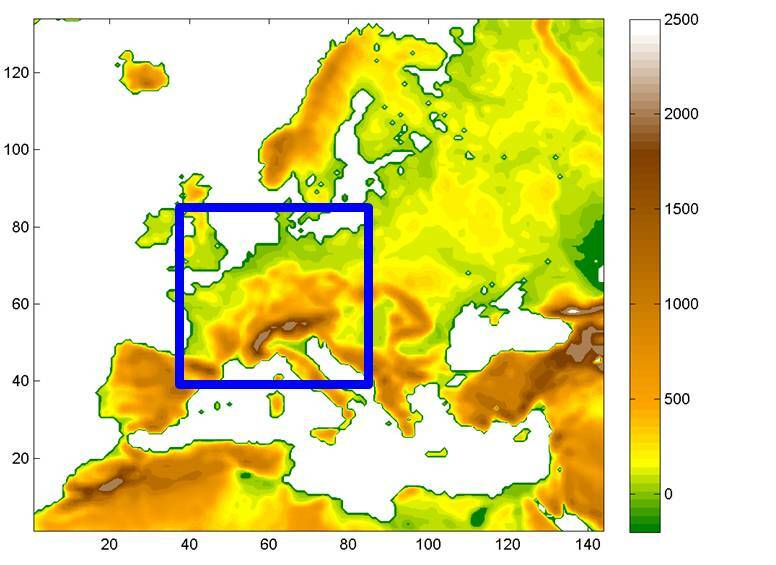 The COSMO-CLM output at 50 km resolution is analysed for Central Europe only considering land points (Fig. 1). The investigation period spans the years 1980-1984. The effect of the AFS is investigated by comparing the mean annual cycle of 2m temperature and precipitation from the reference simulation with the shifting scenarios and observations from the gridded dataset E-OBS (Fig. 3). The mean absolute deviation between Ref and E-OBS is 1.0°C for 2m temperature and 15.9 mm/month for precipitation. In average, the spread between the AFS ensemble is in the order of 0.4°C for 2m temperature and 5.4 mm/month for precipitation. This amounts to 40% (2m temperature) and 34% (precipitation) in comparison to the deviation between Ref and E-OBS. For 2m temperature, the minimum ensemble spread can be found in February whereas the maximum is in May. For precipitation, the ensemble spread is lowest in December and largest in September. Fig. 3: Observed and modelled mean annual cycle of (a) 2m temperature [°C] and (b) precipitation [mm/month] over Central Europe (Fig. 1) for the period 1980-1984. 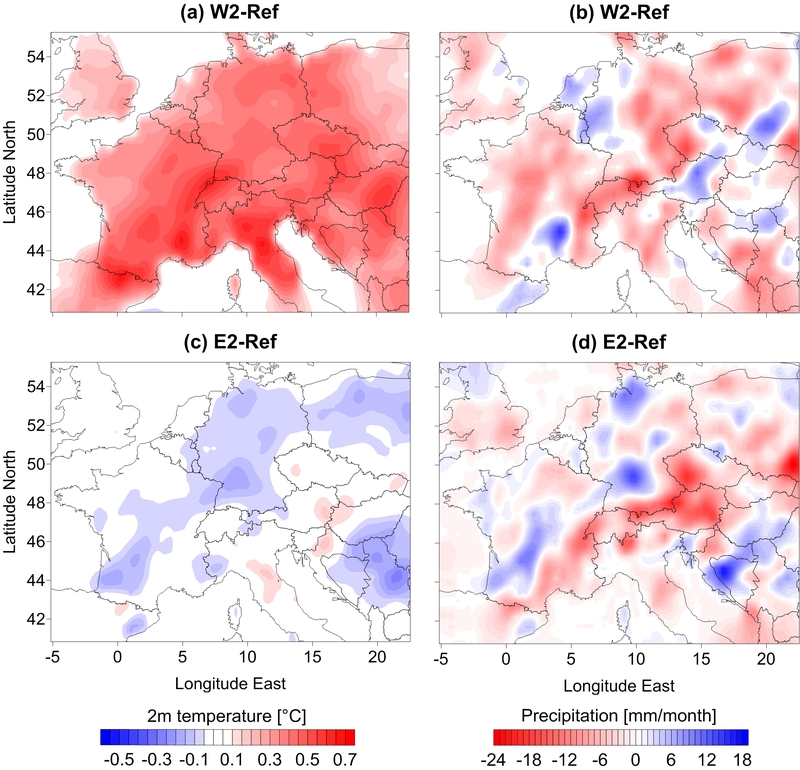 Furthermore, the AFS effect on the spatial distribution of 2m temperature and precipitation in hydrological summer (May-October) is exemplified for the W2 and E2 scenarios (Fig. 4). In comparison to Ref, the W2 scenario leads to temperature increases of up to 0.6°C (Fig. 4a). This coincides with a predominant precipitation decrease of up to 20.4 mm/month with large changes over the Alps (Fig. 4b). Precipitation enhancement occurs in regions where the temperature increases are lower than in the surrounding areas. In contrast, the E2 scenario leads to temperature reduction of up to 0.3°C in France, Germany, Poland and the Balkan States whereas regions with rising temperature are rather small (Fig. 4c). The predominant temperature decrease is associated with enhanced precipitation of up to 16.9 mm/month (Fig. 4d). Precipitation decreases of up to 23.9 mm/month occur again over the Alps which might be an indicator for the sensitivity of precipitation to AFS over orographically structured terrain. Thus, the temperature and precipitation changes resulting from AFS are related to each other. In particular, warming coincides with reduced precipitation whereas cooling is associated with precipitation increase. Furthermore, the comparison to E-OBS (not shown) indicates that deviations between Ref and E-OBS can be partly compensated through AFS. Fig. 4: Differences between the simulations (a, b) W2-Ref and (c, d) E2-Ref for 2m temperature [°C] and precipitation [mm/month] for the period 1980-1984 (only hydrological summer). As concluded from our model experiments, AFS has a considerable effect on the COSMO-CLM results, in particular during hydrological summer. Since the likelihood and intensity of extreme values is affected, an RCM ensemble generated by AFS provides valuable information on the variability of extreme events such as heavy precipitation and dry spells. AFS is thus a valuable ensemble generation technique for capturing uncertainties related to the large-scale atmospheric forcing. Moreover, the synergy of combining different ensemble approaches such as AFS and forcing from different GCMs fosters the assessment of uncertainties in climate modelling and of the predictability of climate change on regional scales. Schlüter, I. und Schädler, G. (2010): Sensitivity of Heavy Precipitation Forecasts to Small Modifications of Large-Scale Weather Patterns for the Elbe River. J. Hydrometeor., 11/3, 770-780. Panitz, H.-J., Fosser, G., Sasse, R., Sehlinger, A., Feldmann, H. and Schädler, G. (2012): Modelling Near Future Regional Climate Change for Germany and Africa. Submitted to High Performance Computing in Science and Engineering.